Gretchen McKay – Gretchen Kreahling McKay, Ph.D. When you don't give up on a student, he or she can do great things. A student on the football team I met in 2016 was struggling in many ways, and I was fortunate that he trusted me enough to tell me about his issues. I refused to give up on him, despite what sometimes seemed even to me really big odds stacked against him ranging from the financial to the academic. My advocacy helped him benefit from an anonymous donor who paid his outstanding bill so that he could register for classes the next term and stay on track to graduate, which he will this May. I do not know who did that, but I will always be grateful. Because this young man got another chance. And a few weeks ago, he presented a paper at the The Mid-Atlantic Region of the American Academy of Religion and The Mid-Atlantic Region of Society of Biblical Literature. It was an undergraduate research panel and his paper dealt with evangelical views and how they led to mass incarceration policies. I asked him, on the eve of traveling to New Jersey where the conference was held, if he ever thought he would be doing this. He laughingly replied something like "no way, Dr. McKay." Yet this is what happens when you do not give up on a student. This is what happens when they love what they study. Doors open for them. When they believe that you believe in them, they try things they never would have done. I can't take all the credit for this, as my dedicated colleague in his major of Religious Studies is the one who truly inspired this student to go farther, do more, and write a paper worthy of a research panel at a conference in the field. How do we put value on that? At a time when the humanities are bashed and programs cut because they do not have enough majors to justify their existences, one may ask: what's the value? Yes, numbers matter, and colleges with finite resources can't teach it all. I sure would like those who make these financial decisions to talk to this student about the value of his experience. Because I am willing to bet that it is something he will never forget, and it's something that will lead to more opportunities. In fact, I would say this experience has further changed his life. And isn't that what the humanities in their best iteration are meant to do? There has been a litany lately of stories, commentaries, and op-eds that basically sound the refrain that professors have a lack of trust in students. There has been a report of a professor at Howard University, who has a stated policy on his syllabi that if there is a family death/funeral on an exam day, too bad. Another story reopened the debate about laptops being used for taking notes (there had been other studies saying that hand-writing notes in class is better) and then the usual refrain about whether or not laptops should be banned. These are extreme stories, but they have at their core the same message: students are not to be trusted. The core message is also: we as faculty know better than you. But do we? Do we really know what students are doing when they are not in our classes? All that "outside the classroom reality" does impact them when they are with us for our 3 hours (or so) a week. Do we really know the familial, financial, and personal stresses they are balancing? Could we try to be a little more generous about why they are on the phones or why they miss class? I am not saying that I am always understanding. I had a frank talk with my classes this past week about how distracted I get when a student is checking his or her phone in class. I am trying to connect with every student in every class (which may or may not be a ridiculous goal, but I hold to it anyway), and when a student is on his or her phone, I get pulled "off my game." My students seemed to understand that. I tweeted last weekend about how I view my students as collaborators in the classroom, that we are learning together. A student from one of my classes saw that tweet and "liked" it. But to be truly co-collaborators with our students, we have to trust them. I know that sometimes they do not read for class. They procrastinate. I try to set up my classes so that they want to read article or at least see why I am asking them to do it. I want them to want to start the paper earlier. True, not every student will, all the time. But I am willing to trust them to do the right thing most of the time. If they sometimes "get me," so be it. In fact, it is they who are missing an opportunity. At the end of the day, I make the decision to trust my students and if they are not doing what they should be in class - and to my mind that means coming to class, being attentive, engaging with me and others and the material - then I talk with them. Because in partnerships, both sides try to meet each other in the middle. Since as the professor I have more of the power in the relationship, I feel it's my duty to take the first step and demonstrate my trust of them in the classroom. Students, I am very interested in hearing from you: how do faculty demonstrate trust to you, and if they do, does that affect they way that you learn? Week one of our spring 2019 semester is in the can. I'm not going to talk about the internet outage, the snow day, the delays, and the fact that I got sick and needed antibiotics all in the first week of class (ok, well maybe I'll just mention it). What I do want to talk about is a mental shift that I realized happened this week after I met all three of my classes. It was suddenly less about the content and all about the students. Now I have faces, not just names, actual people, in my classes. It's not just a roster. It's not just about the number of butts in the seats; I spent so much time fretting in December and early January about having only 12 in one of the classes. Now it's full. I spent tons of hours this past January building my hybrid class both in terms of content online, activities in the classroom, and navigation of the site itself. For my face to face classes I similarly thought deeply about new ways to include more visual analysis. After reading How Humans Learn by Josh Eyler, and expanding on an assessment of understanding international cultures, I thought about how to extend an assignment about learning disciplinary perspectives. All of that is still there. It's in the syllabus, in my course notes for the semester, and I will be planning everything out a few days before that particular class will actually happen. But now that all of that seems secondary. Because now I have the people. The students are now telling me in discussion boards about how this is the last class that they got to choose before graduation, and they wanted it to be with me. Another said that he regretted not taking art history so far over his four years, and after talking to students who had taken my classes previously, did not want to miss out in his last semester of college. Some need the classes for the completion of their minor, or it's a requirement for the major. There are a dizzying array of reasons why students are taking my three classes (History of Western Art II, Roman Art, Romanticism and Impressionism for those keeping score). And they are what matters now. The enrollment, the course planning, the content (which I love; these are three of my favorite classes to teach of all time), and the exercises are all secondary to those individuals who trust me enough to allow me to teach them, guide them, and educate them. I barely know all their names yet (working on it) but their faces - and stories - are all in my mind as we complete week 1. This week the party really starts. And I can't wait. Dr. Gretchen McKay at the 2019 NCAA Convention, Orlando, FL. The room was packed and there was really good energy in the room. 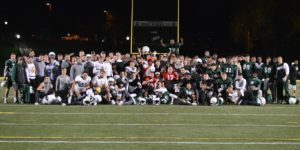 I spoke about how I got here, and those who have followed this blog know about my "original football Romans" who took my class in the fall of 2015 and started me on this path. I decided that I would engage them in my course, which led me to want to know more about what they did as student athletes. Soon I was attending away games, which led to an invitation to become the faculty mentor to the team. Who knew then where it would lead? This post is for anyone who is on a path and can't quite see where it might lead. Keep going. I had no idea that I would eventually end up speaking to a room of about 500 people. And frankly, I am just getting started. I have more research to do on what student athletes do on the field and how that could be better translated into the classroom for their studies. I am planning to write a book that better explains the realities of the Division III student athlete. I hope to do some of the research for that book with student athletes this summer. Today marks the start of the 2019 Spring semester for my school. I will teach my best. I will get to know my students. I will challenge myself to engage all students. I will go to "spring ball" football practices. And who knows what else may come up? Because the truth is, you really never know where interests might take you. But if you remain authentically curious, take risks, and remain courageous enough to step onto an unknown path, you may end up in a place you never thought you would. Like addressing a crowd at the NCAA convention. Author Gretchen McKayPublished on December 24, 2018 December 24, 2018 2 Comments on Happy Holidays! I will be taking a bit of time away from work this week and part of next, but I wanted to leave a post today that will wish everyone a happy holiday season. This is a time when many people look back on their year and take measure of where they are now. They also make goals for their new year. I'll be doing some of that later this week. When I look back over this past year, I'm proud of what I have accomplished by just keeping at it, connecting with people, and trying things based on research and what I feel is right. And my response was: That's true. I don't know everything. But I know why I am doing this: to make sure that students who play a sport are fully supported and understood. And I might not understand every nuance of that, either, but I feel compelled to enlighten others on these student athletes' commitment to their sport and how we can better teach them, support them, and challenge them to the finish line of their college degree. So, no. I might not know what I need to know right now. But I am committed to finding out. I will figure it out. But it takes commitment, resilience, and knowing your "why." And I know why I am working on this project. Published on December 24, 2018 December 24, 2018 Categories student athletes2 Comments on Happy Holidays! Author Gretchen McKayPublished on December 16, 2018 December 16, 2018 Leave a comment on Why Do We Do What We Do? This has been a week of reflection. As one of my colleagues put it, working in higher education creates a constant cycle of whiplash: the semesters begin and then are over. You run with your hair on fire, especially in the last couple of weeks, only to turn around to nothing. Well, your own projects, of course, that you pick up where you left off, usually when it was another season altogether. But the sudden end always takes me by surprise, even having been through this cycle so many times. This question followed me over the past two weeks, which were frenetic in both intensity and pace. For several reasons. First, there are major changes coming to our institution, one that I love and one that I try to make better every single day I am on campus, and even when I am off. It's an uncertain time, but I've been thinking a lot about why I do what I do, personally. But I am also thinking: why does our college do what it does as we consider changing programs. To me, my answer to the question is the students. And learning. And more recently, mentoring. Helping. My focus has changed a lot in the time that I have been teaching, which is nearly 20 years. I like to think that I was always focused on students, but I do so now in a different way. I focus more on engaging them with active learning (which I have written about often here; see list of topics at right). More often now, I listen to them. In doing so I sometimes find their questions difficult. And often, I can't answer them. Take my visit with a student last week. I still can't stop thinking about it. His question stopped me in my tracks, because I had no answer for him. I could not help him. Not anymore. Because his question was, "What will make me happy, Doc?" He explained that he always thought it would be business and making money; those would be the keys to his happiness. But now, he was not so sure. All I could say to him was what I know for sure: he will figure it out, because he's bright, reflective, and perceptive. He's turning some of that perception on to himself, which means, that he will figure it out. He will figure out why he does what he does. So, yes, I know why I do what I do. Yet, the bittersweetness of it hit me like that end of semester tsunami always does: three students that I helped out of several pickles over the past two years or so are successfully done. They'll gradate in May. They are off to find their way in the world. I know my college has given them the foundation to do great things and be successful. And my wish for them is that they figure out why they do what they do. Published on December 16, 2018 December 16, 2018 Categories MentoringTags listening, mentoringLeave a comment on Why Do We Do What We Do? Is Caring for Students “Emotional Labor”? Author Gretchen McKayPublished on December 3, 2018 Leave a comment on Is Caring for Students “Emotional Labor”? There has been a lot written lately about "emotional labor," an idea that is discussed in this article in The Atlantic, which explores the term and how it has creeped into areas that were not intended by the originator of the term, Dr. Arlie Hochschild, a sociologist who taught at UC Berkeley. In this article from The Atlantic, she notes that teachers are among those who "[while] doing physical labor and mental labor, ...are crucially being hired and monitored for [the] capacity to manage and produce a feeling." I'm thinking about that because I have come off a week that was very emotional for me. This past week students came to me for all sorts of reasons: serious illnesses (or tests needed to determine them), deaths in the family (in one case a shooting), and I even learned of the sad fate of a former student. It was exhausting. I am still exhausted. So what is the solution? I know I am not monetarily paid for this emotional work, so what should I do about this? I suppose everyone, especially professors, must decide for themselves how to respond to this reality. On the one hand, a professor could say, students have (for the most part) families, and that they should be supported by those families. That's true, but in reality, some are not. And it's also true that we have a counseling center, and I often walk students there to get counseling if they are in crisis. I am not trained to do counseling. But there is a trust that I have built up with my students. That trust means that sometimes they come to me with personal issues if for no other reason than they are not sure where else to go for help. I help when I can, and direct when I can't. I realize that this explanation is not exactly the definition of "emotional labor" in its original context as penned by Dr. Hochschild. But I am not willing to hold some kind of line in the sand to not be there for students in these ways to avoid the "cost" of this kind of work. If I'm going to have my students trust me, then they trust me. If they trust me enough to share personal stories, how can I turn them away? This is the time of year when my Twitter feed is full of tweets from professors scoffing at the number of dead grandparents and generally not believing - or caring? - about these students and their stress. I dislike the tones of those tweets and comments. Our students are our students, with all of their problems, issues, and stresses. My college is listed in the book Colleges That Change Lives by Loren Pope. In the chapter about McDaniel it opens with these lines: "If you’re looking for a college free from pretense and full of genuine care, put McDaniel at the top of your list." Rather than "emotional labor," I think I am practicing genuine care. I do genuinely care about each of my students. While I may not be paid directly for that, I think it's worth any sense of cost if I can make these students feel supported, encouraged, and yes, even cared for. It is my hope that they can then do their best in the classroom, which is, ultimately, our collective goal at the college. We want graduates who will make a difference in the world. If I can make a difference in their lives, my hope is that each of them will pay it forward. What is your view, if you teach, of the role you play in the lives of students beyond your classroom? Published on December 3, 2018 Categories highereducation, Listening, MentoringTags emotional labor, higher education, listening, mentoringLeave a comment on Is Caring for Students “Emotional Labor”? 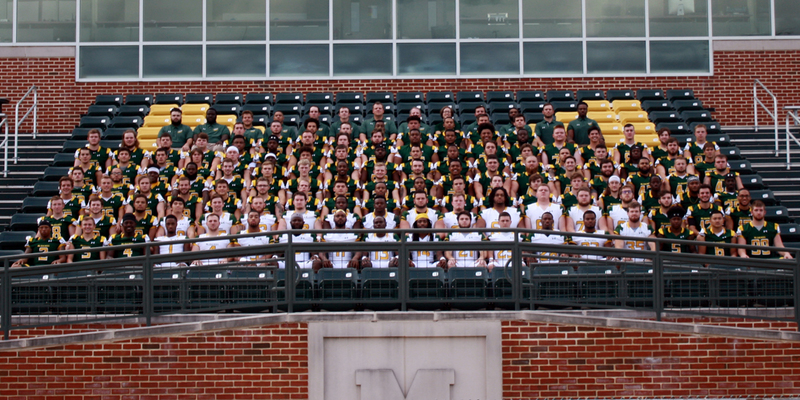 Another season is in the record books for the McDaniel College Green Terror Football Team. It was not the record that we were all hoping for, and I was not able to travel to the last game, which was away. But I watched it on the livestream, and once again I marveled at the grit, resilience, and indefatigable spirit of the players, the coaches, and the fans - parents - who I knew were in the stands. I've come to love all aspects of the culture of this game, but it's the people who make it the best. First, appreciation must go to the coaches, chief among them Head Coach Michael Dailey, who said yes from the start when approached to have a female art history professor as the first faculty mentor to the team. We reminisce now often about how we were going to "figure it out," and we have. I'm grateful for his patience, his answering of my thousands of questions (I am an academic! ), and his embrace of just about every one of my ideas. I have made it a point to get to know the other coaches a bit better this year, though I could have done more on that score. Yet, I know how busy they are. Second, the parents have been fun to get to know, too. What a hardy bunch! And these people know how to party! I can't name names, but I have been gifted with more sausage, sweets, and alcoholic shots than I have ever in my life. At first, it was overwhelming and I did not know what to say or do, which makes professors as a rule uncomfortable. But as I try to tell my students: lean into what makes you uneasy and take a risk. I am glad that I did so because interacting with the parents has been a joy I did not anticipate when I took on this role. And finally, but certainly not last, is my appreciation for the students. Among the graduating bunch this year are some of the first players who sought me out when I did not know what I was doing. I don't know why they trusted me, as I hardly think I gave off an attitude of confidence about my role. All I can think is that my desire to help and to support somehow came through. And I listened. By listening I learned so much. Because many people read this blog and because it's public, I will not name their names. However, they will always be among the most important students in my twenty-year teaching career in higher ed. They (hopefully) know who they are. They made me a better professor, by helping me see how they came alive in debates, games, and other active learning in the classroom. Several of them taught me about what it is like to be a black young man navigating today's society and some first-generation students shared with me the angst at the costs they were incurring. They taught me about grit and resilience, which I have blogged about here before. They taught me collectively about teamwork and why that is important. In the end they have offered me a new way to express my creativity as a professor, a (sometimes) administrator, and a speaker on student athletes and teaching and learning. 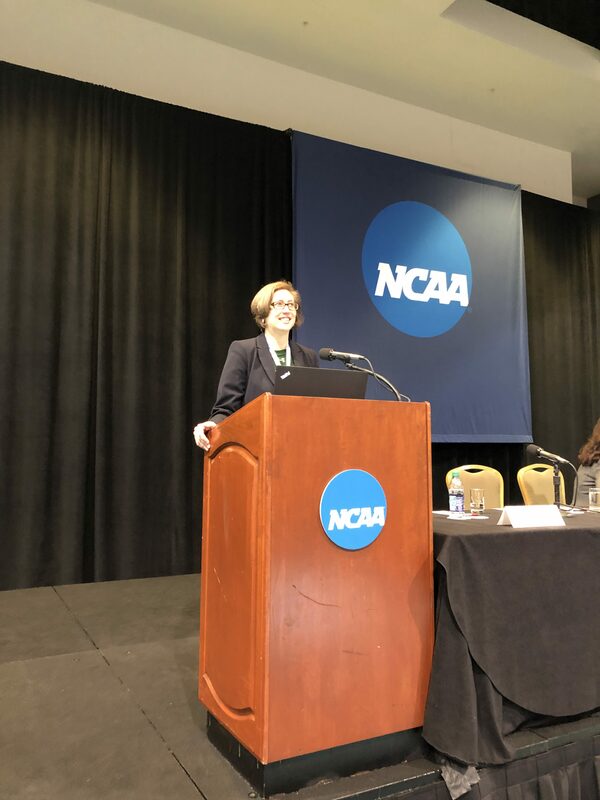 I've been given a new outlet for the next few years to help guide and shape higher education, specifically on how institutions can better support student athletes holistically at the (NCAA) Division III level. 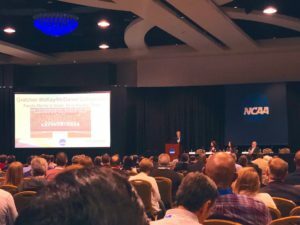 I've spoken at a few institutions, have a book proposal in about my experiences, and will be speaking at the NCAA's Annual Convention in January. 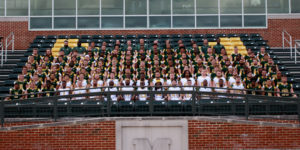 To the entire McDaniel College Football Team: a huge thank you from the faculty mentor. Thanks for making me a member of the team. And when is Spring Ball?!? !